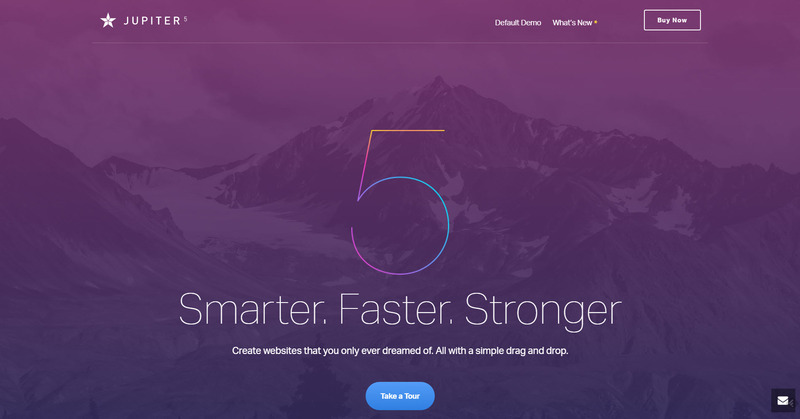 It’s always a tightrope walk when a theme developer attempts to create a product for both the average page owner, as well as the professional web designer. Artbees Themes’ Jupiter, which is currently available in version 5, gets this done. Jupiter is a pretty mature, while still actively developed theme. The developer studio Artbees Themes entirely focuses on WordPress as their design platform. In contrast to other studios, they don’t toss tons of themes on the market and have been sticking to their strategy of trying to cover the market with a total of two products for years now. However, Jupiter, which Artbees Themes calls the only real multi-purpose theme on the market, is even more successful. The theme has accumulated more than 55,000 users already. Jupiter’s flexibility is mainly based on the fact that the 125 included, ready-made templates cover the majority of possible application areas out-of-the-box. I don’t know of any other theme with such a large, and ever-expanding range of templates at no additional cost. And at 59 USD, the theme is not even expensive. If you keep in mind that this price already includes the license of the Visual Composer, which is a drag-and-drop page builder, Jupiter only nets at 25 USD. In any case, Jupiter is worth its price. In contrast to others, Artbees Themes don’t even ask for update fees. You pay the price of 59 USD once and receive all following updates for free. You can tell that Artbees Themes is serious about Jupiter, simply because they have been continuously developing it since 2013. I have checked the numbers several times, since, these days, this type of commitment seemed so unlikely to me. I was already convinced of Jupiter at this point. Anyone that isn’t convinced yet will definitely change their mind after taking a look at the feature set. In fact, Jupiter is well-suited to do everything you can, or can’t imagine. The developers put a lot of focus on keeping Jupiter extremely performant in all of its shapes. As if Artbees followed our five-piece series on WordPress performance, they optimized all possible corners to get the last bit of speed out of the theme. They have even kept in mind to only load styles and scripts when needed. It’s no surprise that Google PageSpeed gave them a rating of over 90 out of 100 for both desktops and mobile devices. That’s because the developers have taken and refurbished the entire codebase for Jupiter’s version 5. According to Artbees, every line of code was evaluated, and rewritten if necessary. A switch to a modular framework has been done as well. With that new foundation, it can deal with large amounts of data and changes better. Artbees uses a method of Parallax Scrolling called “native Parallax,” with the rendering being done directly by the GPU. The 125 available templates make use of the function to different extents. The adjustment of designs is downright fun. Overall, it’s the high flexibility regarding customization which lifts Jupiter 5 above the competition. This flexibility is also what makes this theme interesting for both page owners and web developers. While the page owner directly picks and configures one of the 125 templates until he’s satisfied, the developer can do a lot more with the given variety. The large template portfolio is not the only way to turn the design into your own. I especially enjoyed the variety of different header styles. 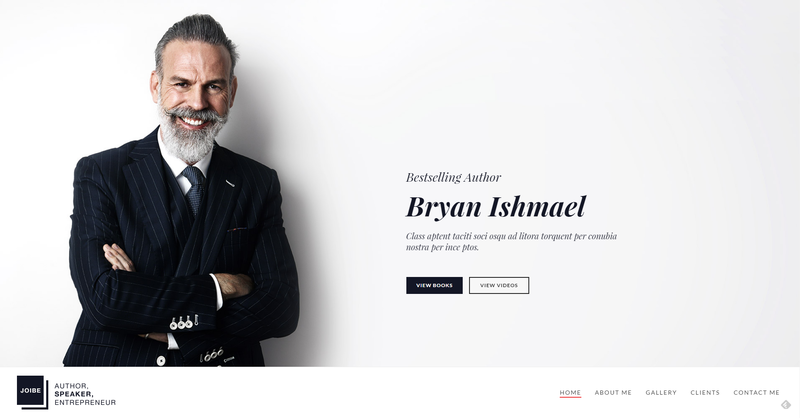 You can choose 18 different designs for the navigation header of your website. In contrast to what you’d expect from the name, you can implement it almost anywhere you want to. 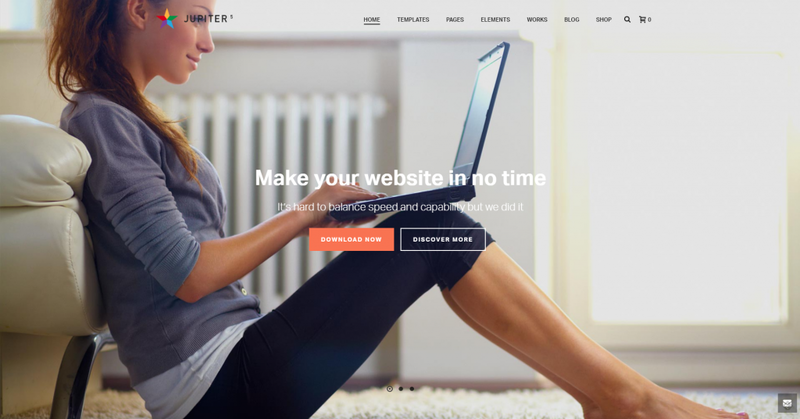 Jupiter’s designs even allow you to run a very appealing online shop. Beyond the fact that Artbees makes WordPress design much more comfortable, the developers came up with some unique ideas to further improve the user experience. For example, they implemented the category showcase. You assign a thumbnail to each WordPress category, and you instantly get an alternative way of presenting your content. The photo display does not require any additional plugins either. If you want to add a price table to a product or service, you’ll be interested in the integrated “Pricing Table Builder.” Comfortably configure your pricing table from the backend. Artbees also has fresh ideas for custom design. For example, you can use SVG shapes as containers for your icons, and also equip them with color gradients. Add color gradients to headings and buttons, if you feel like doing so. These are only the new features of version 5. Before the release of the new version, Jupiter already had more than 100 readymade elements like sliders, photo grids, tabs, hero video, and image areas, carousels, accordions, and a lot more to offer. 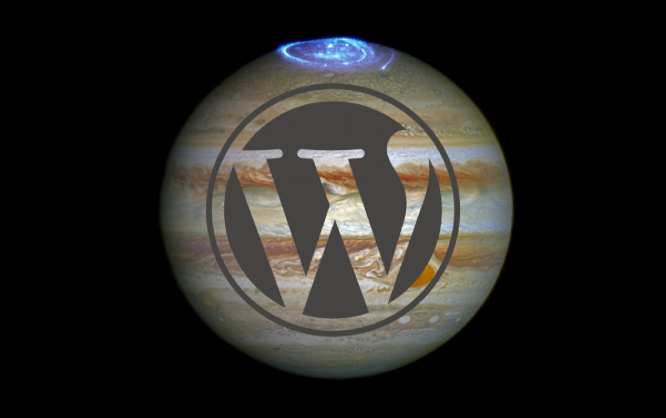 Calling Jupiter a premium WordPress theme is an understatement. It’s more like a full-grown WordPress website builder. As such, it serves the target groups of ambitioned page owners and professional designers alike. We can well call it “made by designers for designers” while the ever-growing portfolio of professional templates keeps it also in the game for those who are seeking to get to results quickly. Take a look for yourself! In the demo, you’ll find all included components behind the respective navigation item in the page’s header. But surf there when you have some time to spend. It will take a while to go through all there is to explore. Disclaimer: This article is sponsored by Artbees Themes. The words are our own. Artbees Themes did not influence the content in any way.